This month we're focusing on the joys of the wood porcelain tile, from imagination to reality your unreachable design ideas are becoming more than possible! Lets start with wood around a pool area. Thanks to the brilliant inventors of the porcelain tile you can bring the authentic natural wood look right to the edgings of your pool. You thought you'd seen it all, but it just keeps coming. So feast your eyes on our affordable wood porcelain range! Our newest wood range is called 'Tree House' remember when you would dream of living in the trees when you were little? Well I still do, and bringing the outdoors in is the closest we can get these days. Alternatively you can bring the outdoors out, out to the patio, the path, the walkway up to the entrance of the office. Tree houses may be a thing of the past but the nostalgia of wood definitely isn't (maybe tree houses don't have to be either...!). This range is special because it comes with lovely 300 x 300 tiles that have subtle impressions of intricate patterns, but if you want these you can't pick and choose which design you want out of the 18 different ones they have. You simply have to order a box of them and get a random mix of the designs, how exciting. The sizes for Tree House come as a traditional plank, this enhances the natural look of the tile. The planks are rather large and come in 266 x 1600mm, 200 x 1600mm, 300 x 1200mm and 200 x 1200. There is a grip finish available in the 200 x 1200mm size, and the 1200 x 300 is the perfect partner for the 300 x 300 Imagination tiles. Special pieces are available including skirting, pool edgings and mosaics. Don't forget, the best thing about Wood Porcelain is you can use it outside! Kicking off our colour feature this month is red, more specifically red wood, not redwood trees like the ones in California but colourful woods in clear red tones. Not just wood, but see our other red tiles that are just as exciting as the wood. If you've always wanted to make bold moves... the time is now. Remember - you can filter by colour on the left hand side when you're browsing through the ranges! Remember when Terra Firma was the new kid on the block? We've just had our first images of a floor filled with the glorious patterns that are Terra Firma Atmosphere, and the best thing about it is they form the floor of an authentic gelato ice cream parlour! 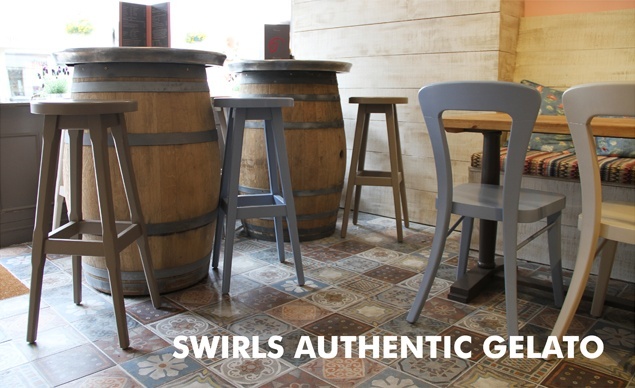 Swirls have made their shop into a warm artistic cozy location - absolutely perfect for ice cream eating. Rumour has it that nearly everyone who enters the shop makes good comments about the floor! The tiles definitely make the shop, the staff there said they love it. We think it's a triumph, the range was exciting when it first got here, and now there is a chance to see it in full glory. The blue furniture in the shop matches the blue in the tiles perfectly, and the soft wood on the walls compliments the look even further. View the Terra Firma Atmosphere range now!